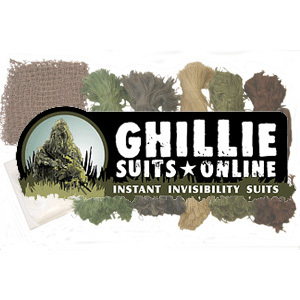 With the Custom Ghillie Kit you can customize your ghillie suit any way you want to! It comes with everything you need to make your own Ghillie Poncho or upper torso Stalker Suit. Every kit contains 7 lbs. of pre-cut and colored jute thread with complete instructions on how to assemble a complete ghillie poncho. It has a 5'x9' nylon netting with 1'x1' squares and 8 different colors to choose from. The Custom ghillie Kit is also available in the four most popular colors just like our pre-made ghillie suits. Ghillie Suit Kits take between 7 and 8 hours to finish. Build your own ghillie suit today!